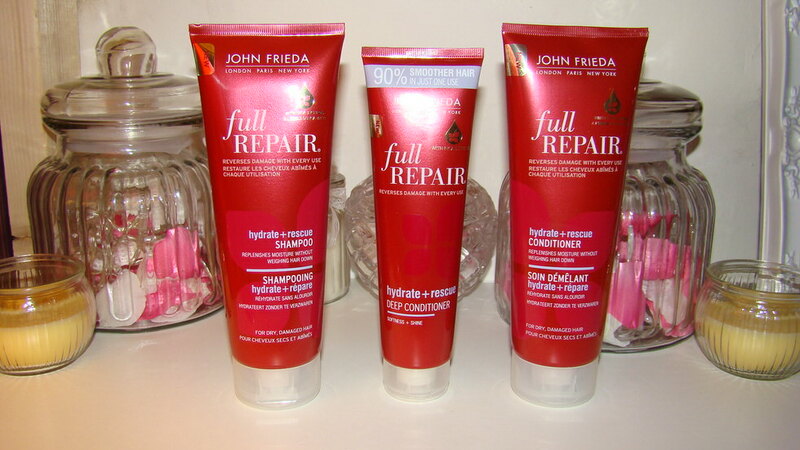 I was kindly sent some haircare products from John Frieda and I am finally getting round to writing up the review – I find haircare products generally take longer to test as it’s different to make-up! You all know I love looking/writing about the packaging of products – even haircare! I love the look of this, red generally is used when you want to capture someones attention – I love the sleek-ness of the packaging and again it’s quite simple and easy to read. I like the fact they’re squeezy with a cap top making it easy to use in the shower however I did find on some occasions the cap was hard to open and I nearly cut my hand but luckily I didn’t! Oh these products smell absolutely beautiful. They’re quite sweetly scented so if you prefer fresh scents then I’m not too sure you’ll like these! If you love the smell of Aussie haircare or the Label.M Oil then you’ll definitely love this! Ok, so here we get to the good part! These products are aimed at nourishing dry, damaged and dehydrated hair – my hair needs all the nourishment it can get as it’s long, curly and prone to dry ends! After shampooing, conditioning and deep conditioning my hair it felt a lot softer from the very first use. I also found that combing was a lot easier as it didn’t tangle as much. I let my hair air-dry and left it in it’s natural state and I have to say it felt really nice and softer! Overall I really am impressed with these products and I would recommend them to family, friends and readers. If your hair needs a boost and a moisture-kick then I do recommend these products – especially the Deep Treatment Conditoner as this really does make hair feel and look healthier. I use this once a week. You can click HERE to purchase these products from Boots and browse through other John Frieda products too! Let me know what you think of these products!